Why Do Refugees Want to Go to England? ‘These shelves are starting to look worryingly empty’, said Steve Stavrinides of Refugee Community Kitchen with a concerned frown. ‘We urgently need supplies’. It was one thing having a deluge of volunteers and donations over the Christmas period where the festive spirit runs deep and the misfortune of others sharpens into focus. But with January upon us, the weather worsening and potential volunteers back at work, the future looked increasingly treacherous. 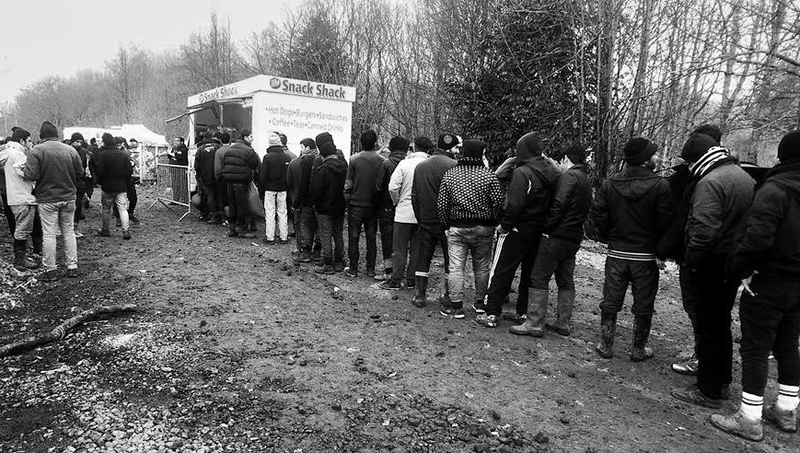 I glanced over at the Snack Shack, a 1984 kebab van that was donated to a sister charity in Calais. Just yesterday, Rufus, one of the tireless Refugee Community Kitchen chefs who works with Steve, had commented on the state of the engine and the telltale smell of burning oil emanating from the chassis. With a critical role delivering 800 hot meals a day to the Grand-Synthe camp, it began to feel that the infrastructure of the relief mission was starting to buckle. As smoke billowed out from the van, myself and Bastien, a fellow volunteer with Artists in Action began to do some very uncomfortable maths. With funds increasingly scarce, buying a replacement vehicle could cripple the food supply. It was my last day in the camps working with Refugee Community Kitchen and Artists in Action, two groups formed in response to the growing humanitarian disaster in Europe. I had been driving the spluttering Snack Shack van for a week, and as I reflected on the families I’d met, the children who inspired me and the courage I’d witnessed, I gulped back the tears. I had made a particularly strong connection with a Kurdish group of refugees who had fled perpetual conflict and through my daily chats with them on the lunch round, I began to understand that even the concept of a homeland was fractured. The Kurds were divided across 4 countries in a crucible of conflict – Iran, Iraq, Syria and Turkey – and had been at the mercy of warring forces for over a century. A Kurdish refugee revealed that he was a geologist by profession, and I couldn’t help but joke back to him that I was mystified why the UK hadn’t given him a visa considering their insatiable love of oil and natural resources. It was a feeble wise crack to be fair, and yet it rang poignantly true. Perhaps BP had their own geologists though, and it struck me that not only were we all fighting back against the military industrial complex in our own way, but that the DIY spirit of community ran through us all, no matter where we came from. This was a recurring theme. As the press paints the refugees as one step away from savages, I was genuinely astonished to discover just how successful the people around me had been in their former lives. This frail, bedraggled man showed me a picture of himself in a very stylish suit, standing in front of his flourishing porcelain factory before it was shelled by ISIS. He then showed me another picture: the pile of rubble and broken dreams that was left behind after the assault. And as he put his phone away, I realised I hadn’t seen a photo of his wife. It didn’t take a genius to work out why. Mohammed, the first refugee I met at the Grand-Synthe camp had no passport, no money, and no one left. I asked him why he and the other residents of the camps were so determined to get to Britain when they had passed through numerous European countries. The British press were using this to demonise the refugees as economic migrants looking for a ‘soft touch’, and with Germany offering greater benefits and a more open entrance policy, I felt I needed to ask directly why the UK was their destination. In almost every case, it came down to family. Those who had relatives, no matter how distant, in other European countries had gone in search of them, while those who saw Britain and the family connections they had there as their only hope had no foundations anywhere else. It was family and the last shreds of identity that drove them towards the Channel. On the way back from the makeshift toilets, I came across a teenager who we had been supplying meals to daily. He was in floods of tears. Unable to communicate through the language barrier, we just hugged and shared a moment of human empathy. He was an individual with a desperate story and there were thousands others just like him, adrift on a sea of crisis and uncertainty. The conditions are dire, the sanitation almost non-existent, and the freezing mud rising. The next day as we made our deliveries, I found Mohammed crying. He was at the end of his tether. “We can’t keep warm at night, hope is fading by the day, we’re trapped with no way forward and no way back. I feel like my sanity is slipping away.” His cough was worsening by the day. While there were many practising Muslims in the camp, many were persecuted Christians and many others were simply not religious. Indeed, the reason the Grand-Synthe camp had so many Kurds in it was because they worried about ethnic tensions with other refugees in camps like Calais. The Kurds had been persecuted in their own homeland, finding themselves a minority in 4 different countries, and they feared that they may not be fully accepted by other refugee communities. That night, a group of young Kurds danced with us to new electronic music coming from our young Kurdish Snack Shack DJ. Ragga beats with synthesised sounds and Kurdish vocals rocked the camp, and on the dancefloor the smiles were truly beautiful to see. A dancefloor filled with people who had lost everything smiling, hugging and feeling the love as their future hung in the balance. Food and clothing aside, we felt that this coming together as a community, irrespective of our backgrounds or theirs was a testament to the human spirit. With institutional inaction ensuring that government assistance to the camp was virtually non-existent, with the National Front dominating regional politics and a media intent on demonising the victims, hope hangs by a thread here.